"They're not house pets, but they're not villains either," said photographer who has been swimming with them since he was a teenager. "They are somewhere in between." 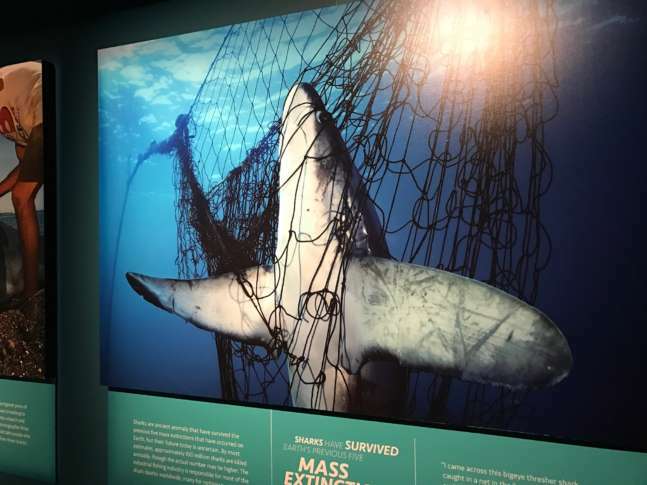 WASHINGTON — A new shark exhibit at the National Geographic Museum aims to portray a different side of the ocean’s top predator. A photographer with National Geographic Magazine for 19 years, Brian Skerry has spent his career underwater, swimming with sharks since he was a teenager. Some of the ever-demonized species face extinction, with an estimated 100 million sharks killed every year. Skerry hopes his photographs — which feature dozens of the 400 different types of sharks in seas across the world — will have visitors reconsidering the animal’s reputation. “They’re not house pets, but they’re not villains either. They are somewhere in between. And in the way that we love wolves and grizzly bears and lions and tigers, we can celebrate sharks in the same way,” Skerry said. The National Geographic Museum exhibit “Sharks: On Assignment with Brian Skerry” is open and runs through mid-October.